The ultimate cleaning app for your Android device! 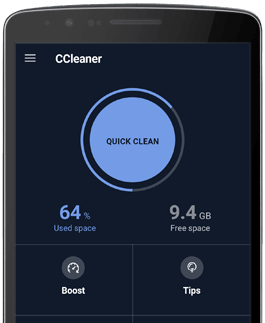 CCleaner optimizes your Android in seconds. Making your device cleaner, safer and faster. In a single click, safely remove the junk that accumulates on your phone, slowing it down. CCleaner can delete application cache, browser history, clipboard content, old call logs and more. CCleaner allows you to quickly and easily remove installed applications on your device freeing up valuable storage space. Like CCleaner, the world’s favorite PC optimization tool, CCleaner for Android comes with a simple and intuitive UI so anyone can optimize their Android device in just a few clicks.